In Idaho, March brings lingering snow drifts in the peaks and valleys of the Payette National Forest. Warmer temperatures on Payette Lake—at least in theory, this wild winter notwithstanding—signal the beginning of the spring melt and everything that entails: budding wildflowers, streams unbuttoning their icy sleeves, and the promise of another summer season in the mountains. But we’re not there yet, are we? Spring in McCall is a waiting game. The winter lingers, and with it the ski resorts and sleighs. But if your winter mainstays have staled, now is the time to cast a line and watch the valley floor transform with an early wakeup call and a cup of coffee. Perk up and take advantage with one of these five spring-season adventures in McCall. 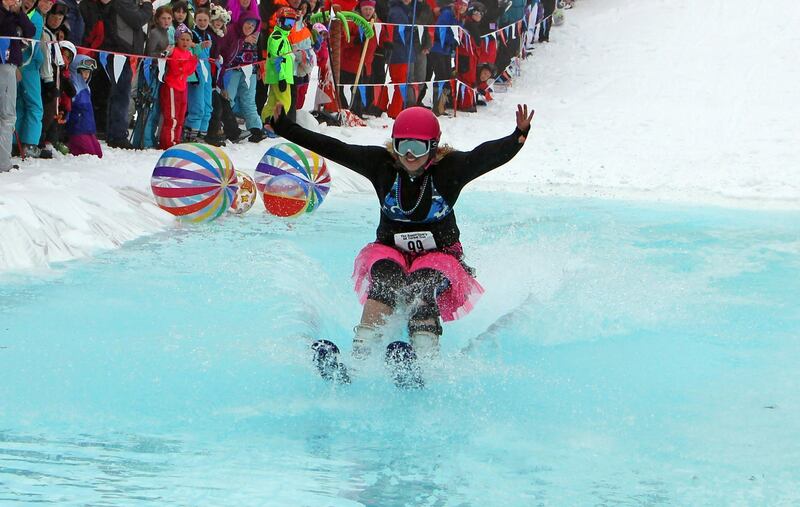 Pond skimming at Brundage Mountain Resort’s Crazy Daze. Brundage Mountain Resort. We are never quite ready to see the snow melt, and it’s easy to keep the winter alive around McCall. Many of McCall’s backcountry skiing adventures require long access routes or snowmobiles, but not so at Brundage Mountain. Its 8 miles and 2,000 feet of elevation gain are open to dogs, and because of Brundage Mountain Resort it is easily accessible and popular with backcountry skiers. Speaking of which: The area’s two ski areas send off the season in style. Brundage Mountain Resort hosts their annual Crazy Daze each April, featuring beer relays, a treasure hunt, a poker run, and everyone’s favorite spring activity, pond skimming. On the south end of the valley, Tamarack Resort hosts their annual Brewski event in March, where event-goers can sample beer from Idaho’s finest brewers. On closing weekend, you can find the State of Idaho Pond Skimming Championships at Tamarack, where contestants can win for Gnarliest Wipeout and Best Outfit. McCall has a resident herd of Rocky Mountain elk, and we are home to a unique experience that puts you face-to-face with them. The Hap and Florence Points Sleigh Rides take visitors on a horse-drawn sleigh to a wintering area for elk, where you can get an up-close and personal view of these amazing animals. Guests are not allowed to touch or feed the elk directly, but they are so close you won’t have to! It is hard to miss the large building in downtown McCall. The Manchester Ice and Event Center is a cornerstone in the community, offering ice skating, hockey leagues, curling, and stunning ice shows. Curling! Public skating sessions are available daily, and if you are up for a fun, new sport, the McCall Curling Club meets every Sunday to hone their skills. The Club also offers private lessons for those wanting to learn the sport. The MEIC is a fabulous place to spend an afternoon on the ice. Crystal clear streams, stunning alpine lakes, family-friendly ponds—so many options, so little time. Fishing is a fabulous way to experience the great outdoors and there is very little to compare to the thrill of reeling in a catch. Whether you are an expert or just starting out, a fly or bait fisherman, McCall has a wide variety of options to fit any style. In the spring, before the winter runoff raises the water level, we recommend the Payette River, where you can expect to catch trout and bass. The easiest way to fish along this river is from the shore, and you can find access points at Ponderosa State Park and the Meanders section just north of Payette Lake. If you are after bigger fish, the Salmon River is your place. Chinook salmon and steelhead reign here. Access to the Salmon River varies during the spring. Common put-ins include the Pine Bar Recreation Site (the Lower Main Salmon River) and Boundary Creek (Middle Fork of the Salmon River). For the best experience, we recommend accessing these waters by drift boat, raft, or on a jet boat charter. Beer knows no seasons, only the difference between winter ales and summer pilsners. McCall, Idaho, is home to three craft breweries, and as any local can tell you they make them all! They are so amazing, in fact, just about every restaurant in town dedicates a tap or two to local beer. The McCall Ale Trail celebrates our local beer scene and gives you a chance to win prizes for drinking local brew. Just pick up your passport at any of the 25 participating breweries or restaurants, collect 10 stamps, and redeem for a commemorative pint glass! McCall, Idaho is big on adventure and small town charm. In the winter, smooth corduroy and deep powders stashes define the season. With three ski resorts, 60 kilometers of Nordic trails, endless routes for adventurous snowshoers and fat bikers, we promise you won’t be bored. After a day in the snow, warm up in one of our natural hot springs or enjoy an après outing at one of our local breweries, bistros, or eateries. As the snow melts, McCall transforms into an idyllic lake town. Paddle boarding and canoeing on Payette Lake, world class whitewater, five golf courses, mountain biking, and hiking are what summer in McCall is all about.